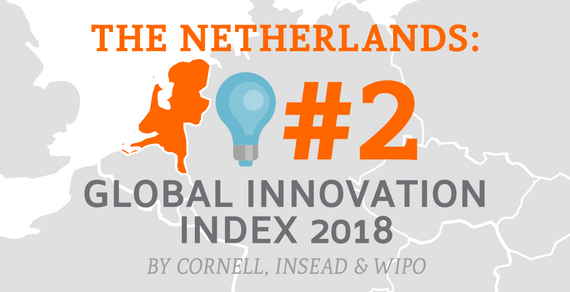 According to the Global Innovation Index (GII), the Netherlands has further improved its position by climbing from the 3rd place in 2017 to the 2nd one this year, being placed right after Switzerland and followed by Sweden, the United Kingdom, Singapore and others. The GII justified Holland’s second place mainly by its „strong, interlinked business sector that collaborates well with universities.” It also highlighed country‘s knowledge and technology outputs, logistics performance, cluster development and creative outputs. The GII uses for its surveys several indicators that explore education, infrastructure, environment and business sophistication. It is currently a key benchmarking tool for business executives, policy makers and other important participants on the market. Concentrating on a different topic every year, this year’s theme was “Energizing the World with Innovation” – a theme emphasizing not only an innovative work in climate-friendly green technology but also a need for new social, economic and business models and a necessity of getting wider awareness of the impacts of diverse energy policies.